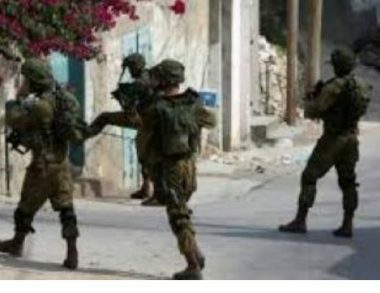 Israeli soldiers invaded, Sunday, Hebron city and Ethna town, west of Hebron, in the southern part of the occupied West Bank, and searched many homes. on Saturday at night, the soldiers abducted a Palestinian near Nablus. Media sources in Hebron said the soldiers invaded many neighborhoods in the city, and searched them, causing damage. They added that the soldiers also invaded homes in Ethna town, and searched them using k9 units. In addition, the soldiers installed several roadblocks at the entrances of a number of villages, towns and refugee camps in Hebron, stopped and searched dozens of cars and interrogated many Palestinians while inspecting their ID cards. On Saturday at night, the soldiers abducted Fadi Roshdi Hamdan, from Arraba town, south of the northern West Bank city of Jenin, while crossing Za’tara military roadblock, south of Nablus.